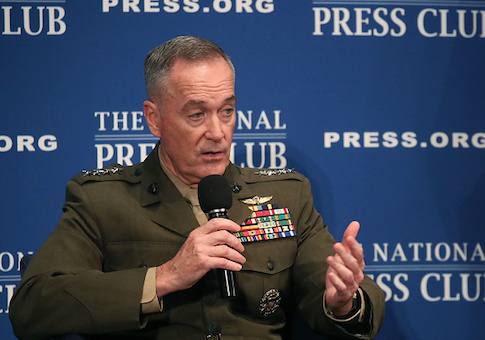 Chairman of the Joint Chiefs of Staff Gen. Joseph Dunford will meet with Russian military leaders on Friday in Helsinki to discuss the situation in Syria among other matters. Gen. Valery Gerasimov, chief of the general staff of the Russian armed forces, will represent the Russian government in what will be the third face-to-face meetings between the two generals, the Department of Defense announced. U.S. Air Force Col. Patrick Ryder released a written statement on Thursday announcing the upcoming meetings. "The two military leaders will discuss the deconfliction of coalition and Russian operations in Syria and exchange views on the state of U.S.-Russia military relations and the current international security situation in Europe and other key regions," Ryder said. It is not expected the meeting will result in any increase in military cooperation. Russia has a large military presence in Syria already, working with the regime of Syrian dictator Bashar al-Assad. However, they have spent little effort combating terror groups such as the Islamic State and instead has focused on rebel groups, some of which are supported by the United States. The United States and Russia occasionally do communicate and notify one another of military operations they are conducting in the region. Additionally, Russian troops are in parts of Georgia and Eastern Ukraine. The United States has provided aid to both countries, to help them counter Russian forces. Officials say Russia's actions have made it impossible for military cooperation between the two countries. Dunford met earlier on Thursday with Gen. Jarmo Lindberg, his Finnish counterpart to discuss cooperation between the two countries. This entry was posted in National Security and tagged Bashar al-Assad, Joseph Dunford, Russia, Syria. Bookmark the permalink.